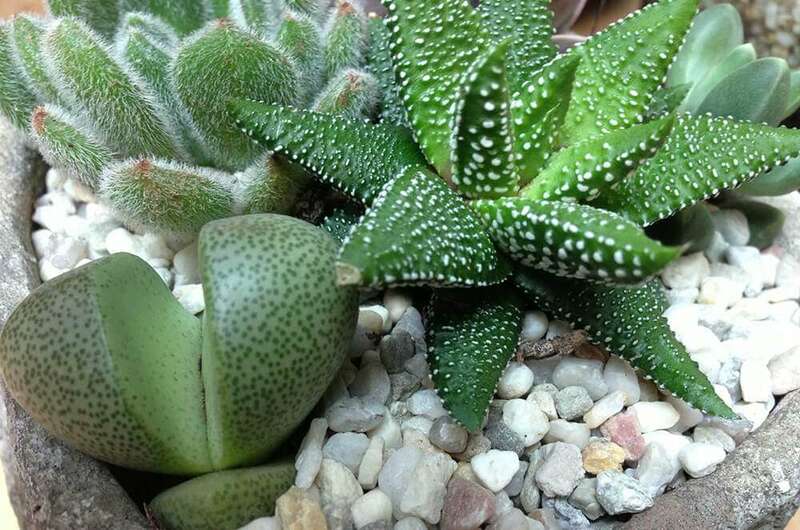 Succulents and cacti presented as miniature gardens in open containers are a fantastic way of introducing space saving, low maintenance plants to your home. Here is our guide to creating a unique micro landscape. Firstly, a few things to consider when choosing your plants and containers. It is essential that you select plants that are compatible in terms of water and light so that the garden is easy to look after and all the plants will thrive together. Plants of contrasting colours and shapes will make the most interesting display, and the addition of natural stone and wood will add some character. As long as your container is open, water-tight and deep enough to accommodate plant roots, pretty much anything goes. We have a massive selection in store. Step 1: Fill your container with fine gravel to the depth of 5cms. This layer is vital for drainage. Step 2: Add a thin layer of succulent and cacti compost (minimum of 5cms). You can create different depths here, or slanted surfaces to elevate sections of your garden – just make sure your plant’s roots are surrounded by soil. Step 3: Cacti are difficult to handle so use some rolled up newspaper to protect yourself or make some long-handled spoons with garden sticks. Plant your first cacti or succulent and gently firm compost around it to secure it in place. Add other plants until you are happy with your arrangement. Step 4: Once fully planted, add another layer of your drainage stones to clean up the look of your garden and create an interesting landscape. Gently brush any soil or gravel off your plants and objects with a paintbrush if needed. Step 5: Carefully water the compost without saturating it. Water as and when the compost is dry – this will be infrequently in the Winter but more often in the Summer. Do not allow water to build up in the bottom layer of gravel. Place your garden in bright light but away from the hottest midday sun.